Catching Memories and Seeing Stars: Cat Ornaments…. I’ve let things drift for a while, but as it’s a few weeks before Christmas the time seems right for passing a few nice ornaments to local charity shops. It isn’t that I don’t like them, it’s that I want the things I keep to have a practical use or to hold memories I want to keep ….. The first thing I must say is that I love cats, I grew up with cats, and that I really want to have a cat again one day. But there are two good reasons why I can’t have a cat right now. The first reason is because we live on a busy seafront and I wouldn’t feel safe letting a cat out. The second reason answers to the name of Briar. When she was a curious puppy she used to go up to cats and introduce herself, and it was all quite amicable until one day a cat reached out and scratched her on the nose. I think it was then that she decided that cats were mortal enemies to be barked at and chased whenever an opportunity presented itself. The sad side-effect of that it that the local cats, who tend to congregate in our back lane, scatter whenever I go out, even when she isn’t with me. I wish I could explain that she’s always on her lead when we go out and that all they have to do is stay put, because if they don’t run she is completely bewildered. I remember a lovely black and white cat called Felix who used to live a few minutes walk away. He used to sun-bathe and he didn’t react at all when Briar went by, however much fuss she made. I’m getting away from the point: the point is that I like cats and that I’ve accumulated a few cat ornaments. I don’t have a strong attachment to any of them. We used to trade pottery animals from a local shop (Tremain Pottery) to each other when I was at secondary school. I’m not sure what the history of this pair was, and though I’ve had them for a long time, I remember them in rooms in halls of residence and rented flats, I don’t find it difficult to let them go. 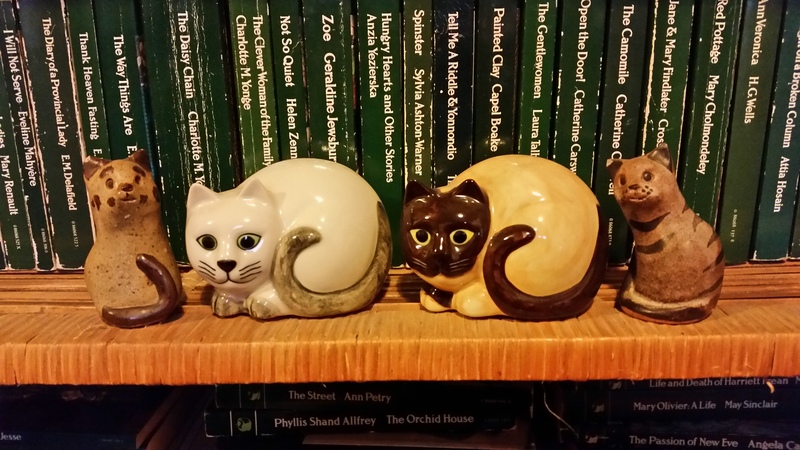 The china cats were gifts from an elderly aunt, twenty years or so ago. I do like them, but I hope there’s somebody else out who’ll like them even more. So the cats can go, and the memories can stay …. Poor Briar! I’m not surprised she’s got a grievance against cats! I had been doing quite well with shedding things, but with the cold and dark of winter I’ve somehow lost the impetus. I think the new year will spur me on though! I lost the impetus too, but I cleared out a couple of bags of books and decided to keep going. I think you’re right about letting certain things go, but sometimes it feels very hard. Someone out there will adore those cat ornaments and give them a happy new home. Yes, it is difficult but this project is helping, and the thought that I’m sending the cats out into the world to meet a cat lover. Wow. You and I have a lot in common. I, too, want to hold on to everything that belonged to my beloved parents and they’ve been gone seven years. I have a lot of things that I’ve just accumulated (mostly books and cds). I really like your idea of taking pictures of things and then letting them go. Best of luck. My mother is in a nursing home, and there are so many of her things that I have to hold on to, even though I know she’ll never want them again and she won’t miss them, But the writing and photographing process is helping me shed some things and just hold onto the important bits of my family history. I need to do some serious decluttering too ………we are planning on downsizing soon so all the stuff we have accumulated over the years just won’t fit …….as you say, it’s the memories that are important ……not the things . Good luck! We’d have to step up the clearing out if and when we move, but for now slow and steady and catching the memories is working well. My little Woody IS a cat and he doesn’t like cats, either! He got bit in the leg by one when he was a stray and got an abcess — it is how/why we brought him in our house and he became our indoor cat. Now, when he sees a cat from the window he goes crazy! It’s so hard to let things go sometimes because you are afraid that you’ll forget the memories associated with them so I love the idea of photographing and writing about them to keep the memories present. Those ornaments are wonderful – I’m sure someone will snap them up in no time! I am struggling with the letting go at the moment. Your plan to photograph and let go seems excellent. The photographing idea is great, I might do that, too – so many things to hold on to, so many memories. Clutter scares me and I occasionally give away things, clothes mostly, when I feel there are just too many and no matter how much I like the blue dress, its days of glory are long gone. The cats are lovely. My parents had figurines like that – they probably still do. It is a lovely project, Jane, with the combination of photos and words to preserve memories. Moving a couple of years ago pretty much forced me to de-clutter, without as much time as I’d have liked to really consider what to keep and what to let go. People frequently give me figurines of cats, and other cat-related items, because they know I have cats. I appreciate the thought, but I don’t want cats everywhere on everything, and not just because it might make me look like the “crazy cat-lady” stereotype. I should probably worry more though that the books piled up everywhere make me look like a book hoarder. My mum’s Labrador seems to think cats are for chasing too, she hasn’t caught one yet though. The pug thinks birds are for chasing, but I think she has even less chance than the lab of catching anything.